Summer's long sunny days make the water's call only seem more alluring, and after searching through our old summer clothes many of us decide to seek a new pair of swim shorts. Unfortunately wading through a pool of thousands of swimsuit brands and designs for the perfect trunks can seem overwhelming. We at Primer have put together a varied list of the best swim shorts for the price. 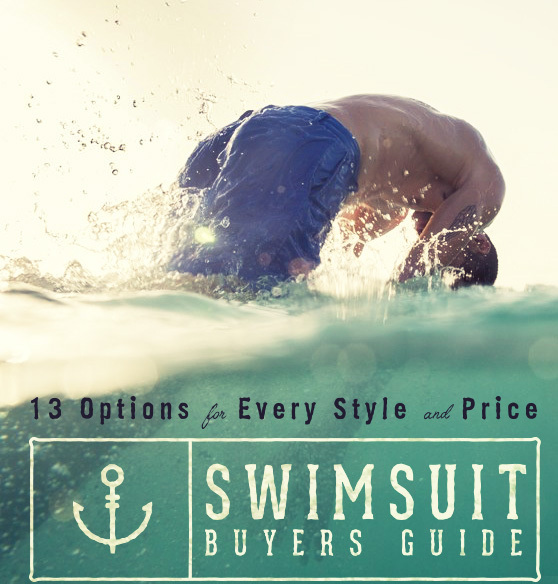 Short or long, solid or patterned, expensive or affordable, here you can find a swimsuit that fits your personal style. Wisconsin's Lands' End offers a great value with their 6″ Volley Swim Trunks. Available in a variety of colors, the traditional-fit swim shorts are equipped with a drawstring elastic waist, sunglass loop, and a sealable rear pocket. The trunks are made of a soft quick-drying polyester fabric that is chlorine resistant for increased color durability. Built with an interior liner, this swimsuit is big on utility. 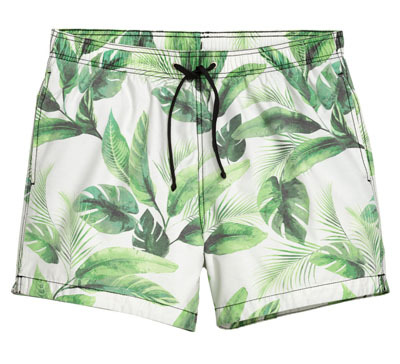 H&M offers a wide selection of Hawaiian-style swim shorts. Their green leaf print on white is both simple and seasonal. H&M's mesh-lined cotton and nylon swimsuit has an elastic draw-cord waistband, side pockets, and a Velcro back pocket. The suit's hem hits mid-thigh with a 5″ inseam. 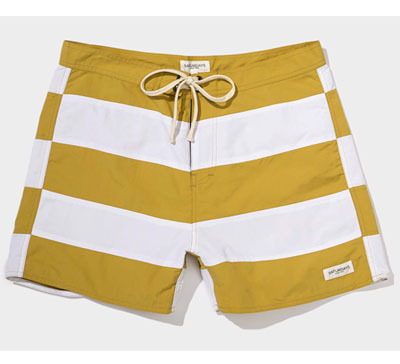 Original Penguin offers sewn polyester swim shorts with stripes of varying fabric designs. The main fabric is a deep chambray style, while the central fabric stripes have a seersucker appearance. The fixed-waist woven swim trunks come in a number of sizes and include four pockets and two rear darts for a slimmer fit. Many Original Penguin swim shorts are justifiably above $70, fortunately some trunks such as these have a reduced sales price. 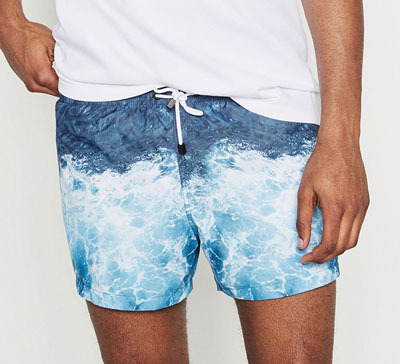 ASOS, a massive online clothing retailer, offers polyester two-tone swim trunks. 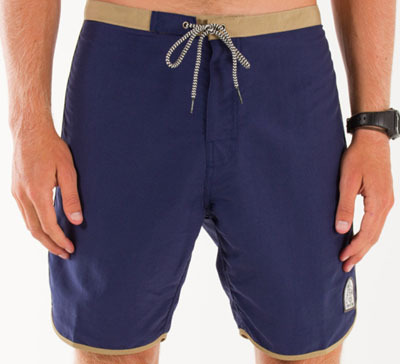 This pair of navy swim shorts creates contrast using a white waistband and trunk hems. 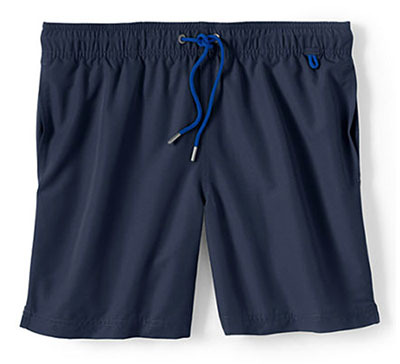 These swim shorts have a snap clasp above the zip fly and side fasteners for a leaner fit. Zara is a European clothing brand known for its fashion-forward designs. They offer comfortable polyester drawstring swim shorts designed with a high contrast wave print. Before taking the plunge, be aware that many of Zara's swim trunks are only available in Medium, Large, and Extra Large sizes. 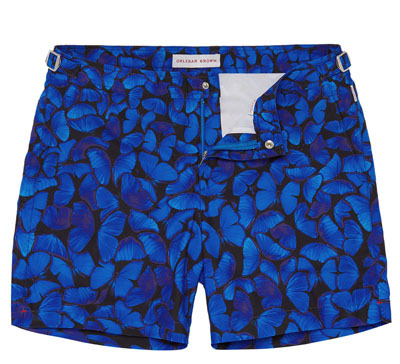 Topman, a British fashion brand, stocks a number of interesting swimsuit designs. 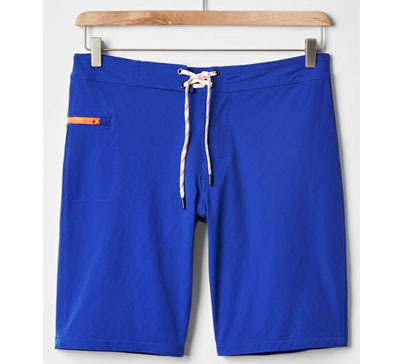 With this pair we return to the popular elastic and drawstring polyester swim short. 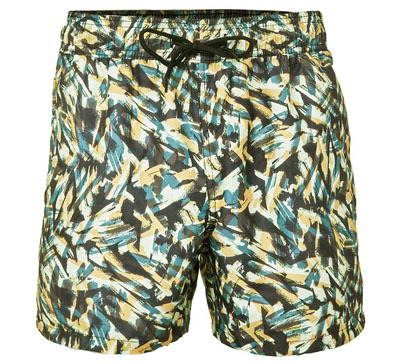 Mesh lined with three pockets, these swim trunks sport a unique paint-stroke camo design. If you tend to stay active but are not interested in showing off a lot of thigh, GAP's 10″ stretch board shorts are a great choice. Hitting just above the knee, these drawstring polyester-and-spandex swim shorts have a straight fit and a simple navy blue design with a contrast side zipper. The shorts include a button fastener above a zipper fly, and the rear pocket has a hidden zipper for your hotel keycard. 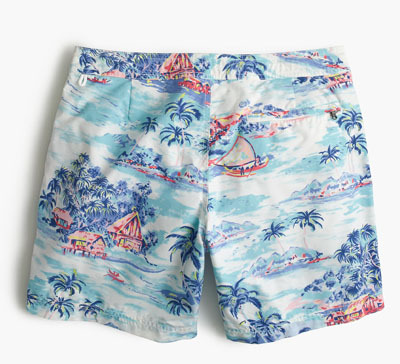 Not too short and not too long–J.Crew offers 6.5″ nylon swim shorts printed with a tropical landscape. Portrayed are blue palm trees shading red ocean houses atop stilts. A tab closure above the fly gives the shorts a more refined appearance. These mesh-lined print trunks come fully equipped with rear darts, a zip fly, two side pockets, and a zip rear pocket. J.Crew regularly has sales, so look out for when these drop to $50. California-based Katin brings us a pair of unique contrast-bordered swim trunks. Coming in a wide variety of sizes, these lengthy trunks are made of a highly durable 4-ply nylon. 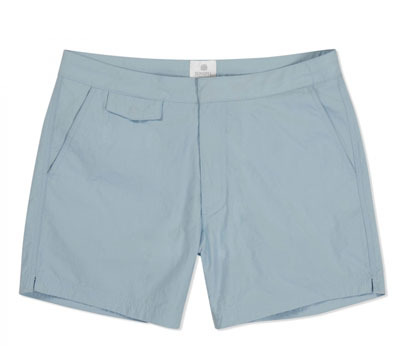 The swim shorts are seamed with rear darts that give them a more tailored shape. The suit has a rear pocket for additional cargo and the waist includes a snap closure that assists the drawstring. 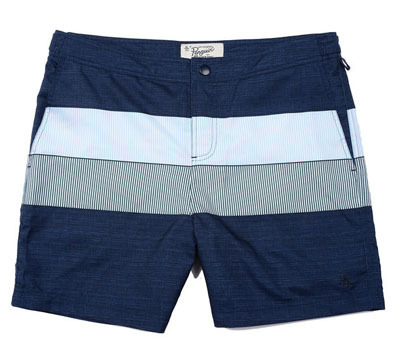 Saturdays Surf NYC may call them boardshorts, yet these swim trunks have an inseam of merely 4″. These nylon shorts feature a rectangular color-block scheme that is stitched rather than printed. Stitched construction and rear darts attribute to the trunks' slim fit. The front fly is fastened with Velcro and the waist is bound by a cotton drawstring. Saturdays' swimsuit displays predominantly unabridged stripes, interrupted only by its fly and rear pocket. Outlier is best known for their versatile activewear made in New York City. The 8″ New Way Shorts are constructed to be comfortably worn in any environment including the water. Outlier's “F. Cloth” fabric is a 3% Elastane and 97% Nylon woven canvas with two-way stretch. The fabric is durable, breathable, and water resistant. New Way Shorts have many impressive details; pockets have a military-standard mesh that allows water flow-through, the interior drawstring is parachute cord with a triple barrel knot, and the shorts themselves have a tailored cut. New Ways also have belt loops, a YKK zipper fly, and Italian-made buttons. There are many more affordable swim shorts, but it is difficult to find a pair that puts so much emphasis on the details. 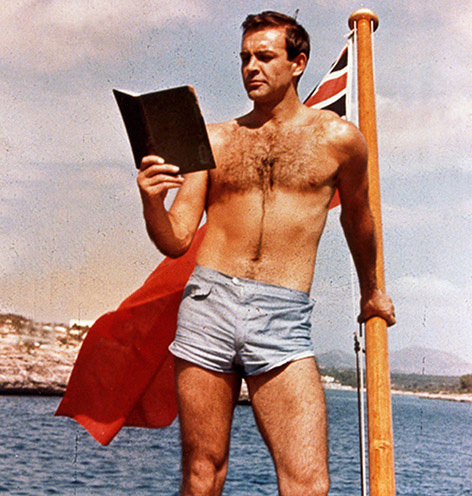 Inspired by Sean Connery's swimwear in James Bond film “Thunderball”, Sunspel sought to create Bond-chic swim shorts using today's styles and technologies. The result is a beautifully tailored, minimalist swimsuit. The fabric is a chlorine- and seawater-tested polyamide. The trunks have an inner mesh and an interior drawcord. The 5.5″ shorts have a hidden zip fly, a covered front pocket with a key loop, two side pockets, and one rear pocket. While sitting poolside photographer Adam Brown realized that many women's bathing suits looked great and the men's did not. Brown sought to create a stylish summer short that appeared equally masterful in and out of the water. Orlebar Brown was born. The most popular of his swimsuit designs is the mid-length Bulldog which is available in solid colors, elaborate artistic designs, and photographed summer landscapes. The Fauna Print shorts' butterfly collage is painstakingly seamed to appear seamless–from waist to hem, the print is one continuous image. These 6″ trunks include a zip back pocket, two side pockets, and a zip fly with a metal snap. The polyester shorts are designed with an inner mesh lining, two metal side fasteners, and a fixed non-elastic waistband. Thorsun also offers some classic length albeit pricey trunks in some cool patterns. I have a pair of Katin trunks (not the ones pictured) and they are by far my favorite pair I own. Great fit, comfortable, and classic style. Could not recommend the brand any more highly. Thanks PB! Very much appreciated and we are so stoked you love our trunks. 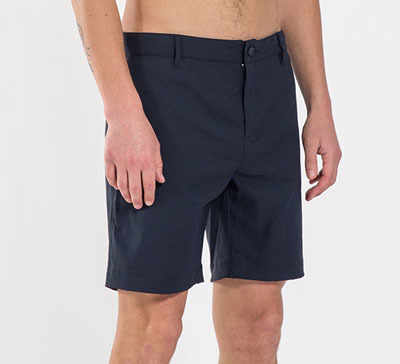 For a cheaper version of the Outlier New Way, check out Dockers Alpha On-The-Go shorts. The quick-dry material is a little different and so is the length. Dockers’ description says that they have an 11″ inseam, but they hit 2-3″ above the knee with my long legs. By my measurement, they’re only 10.5″ and they come with mesh pockets, zippers on rear pockets and a drawstring. They’ve also been on deep discount lately (I paid $9 for mine). Onia have great men’s swim trunks. I’m firmly in the split shorts camp. I love my Brooks pair, 2.5″ inseam and zip pocket. They’re a bit shorter than most people wear, but I love them and think that after a week no one would wear anything longer. I’m a HUGE fan of Vuori’s Cruise Boardshort, and some designs are on sale right now! The fit is great, the design is classy, and the pockets make it versatile and easy to use for anything… actually, I just got home from the rock gym and I’m wearing a pair right now.